As part of a community initiative, Inspire to Aspire, pupils from Mr Doey’s Primary Six class spent an entire school day on the Ballycastle Road. The excited pupils and Mr Doey were given a stadium tour, before members of the first-team squad helped with numeracy and literacy lessons. 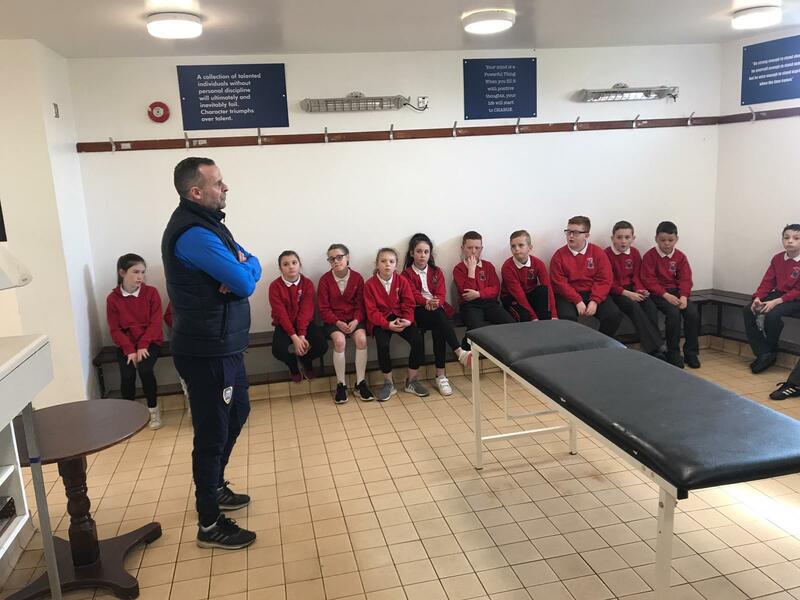 Strength and Conditioning coach Chris Gregg spoke about the importance of diet and exercise, with the pupils also being shown around the changing rooms by manager Rodney McAree. PE lessons were enjoyable as there was a competitive game of dodgeball with the help of Head of Youth Development John Gregg, Rodney McAree and several first-team players. At the end, pupils received a Coleraine FC goody bag and a certificate from members and management of the first-team squad. Stevie McCann, General Manager at the club, hopes that more local schools will spend their day at The Showgrounds in the near future. “Coleraine FC were delighted to welcome Ballysally PS to The Showgrounds,” he said. “This is a new initiative which was the brainchild of Simon Magee in conjunction with the school. “We have a facility which we want to utilise to further develop our club and community links. A statement from Ballysally PS read that the pupils were inspired by spending time with their role models. “A Primary 6 class from Ballysally Primary School were inspired by having a school day in the Coleraine Showgrounds,” the School added. “This was an opportunity for Mr Doey to take his pupils outside the classroom. It really was inspirational for the P6 class to learn numeracy and literacy alongside the players and manager. “They supported through small group tasks and provided educational support throughout literacy, numeracy and PE. “It was great to have Chris Gregg to give our children a talk on healthy eating. Our aim is that this new initiative will create aspiration in our children here in Ballysally. That they will be inspired and see that education is important and seeing their role models has enhanced that dramatically. “The community of Ballysally is now talking about it and this can only be a positive thing. “We want to say thank you to all the players, manager, and directors for making this day, a day that will live long in the memory of our children.